Ghidorah emits Gravity beams from his wings in new Godzilla 2019 TV Spot! A new TV spot for Godzilla 2: King of the Monsters (2019) has been spotted and recorded today! The recording is low quality and an official upload is likely on the way very soon. But, we couldn't pass up the opportunity to share the new footage shown in this new TV spot. 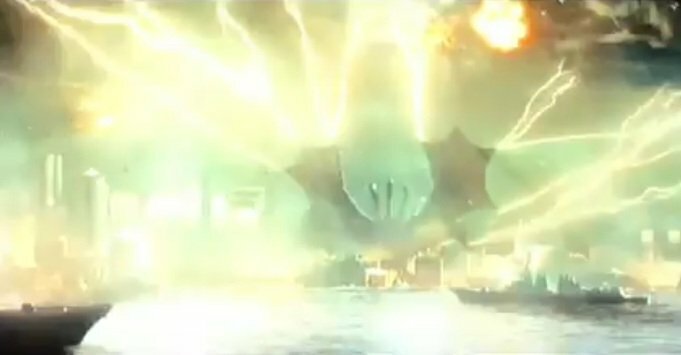 The new footage shows a variety of new cut-scenes - some of Ghidorah emitting Gravity Beams from his wings and Godzilla literally throwing Ghidorah to the ground! We suspect the official title for this spot will be something like "Throw Down", for obvious reasons. 9 Fan responses to Ghidorah emits Gravity beams from his wings in new Godzilla 2019 TV Spot! Wow, so it seems like this version of Ghidorah might be slightly based off of Grand King Ghidorah. Amen! Doughboy please don't kill our Dragon Lord King Ghidorah. This is looking awesome! And also a classic Godzilla move, tossing Ghidorah like that xD You can tell Dougherty knows his Godzilla! I love it! I just wish the trailers were in better quality. I'll wait until the TV spot is officially released on YouTube. I bet it looks nice, though.